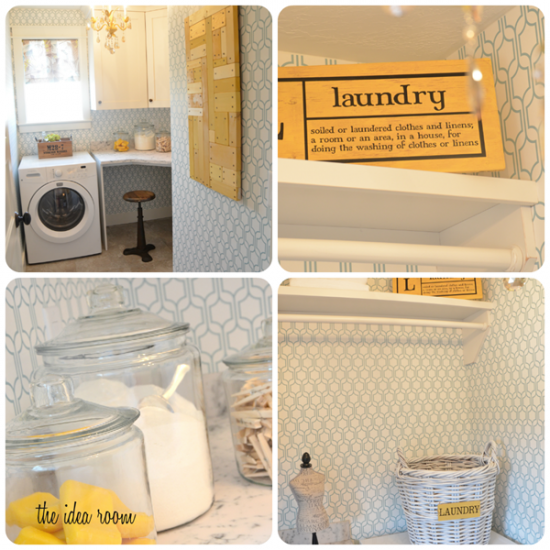 Have you seen the DIY Blogger House? 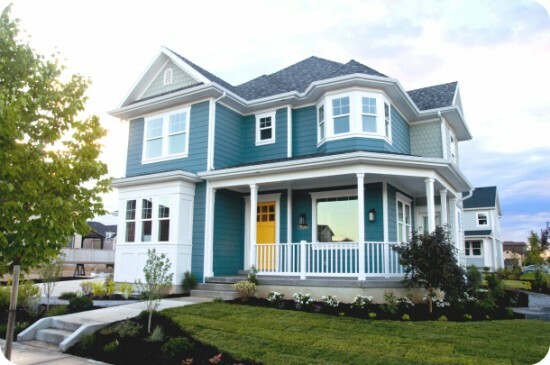 It is fun to see what a group of bloggers could do to a house with a budget. a contractor and their own creativity! Check out of a few of my favorite spaces! To see more of this house and all the ideas they have to share (and you WILL want to! ), visit these lovely ladies and their blogs (and the rest of their team!) via the links above to see the rest of the inspiring home tour! Great job ladies!! Don’t you wish you could visit a DIY Blogger House in real life? I do! That is so cool! What a neat idea, and I love the dining room, too! 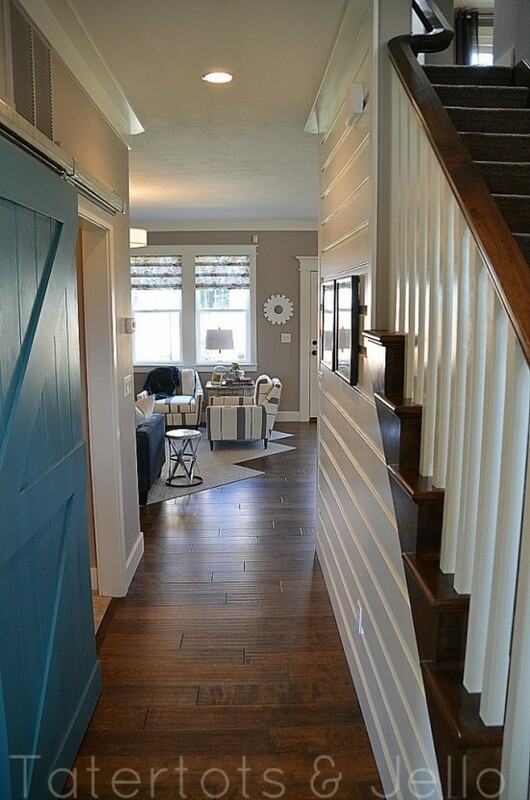 Loving the hall/stair with the paneling and the great barn door! Those are horizontally planked walls, not vertical. Vertical is upright. Horizontal is parallel with level ground. Anyway, I love the planked walls as they are. 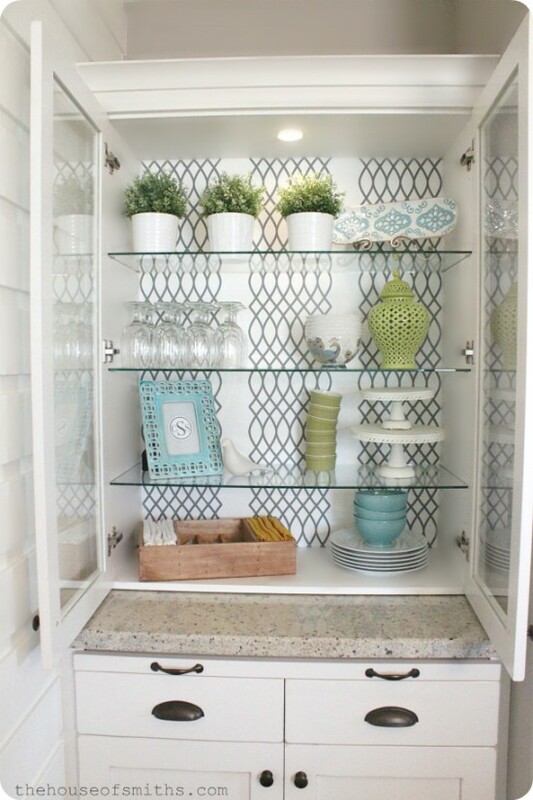 The built-in hutch with the papered back, oh my goodness, is gorgeous! Thanks for sharing. Oh yes, that is why I should never blog at night! :-) Fixed it. Thanks for blogging about our project Melissa!! That really means so much!!! You are most welcome, the house is great!! What talented ladies!! I’m amazed…absolutely charming! Thanks for the tour Melissa. So beautiful, especially the little china hutch. Occasionally places that sell granite have a piece they’ve cut out for a sink in a large job which they are willing to sell as a remnant. This is fabulous! Where is it? Utah :-) you can find out all the details in their posts. Lovely home! The traditional bones of the house are blended well with a more modern style of decorating. 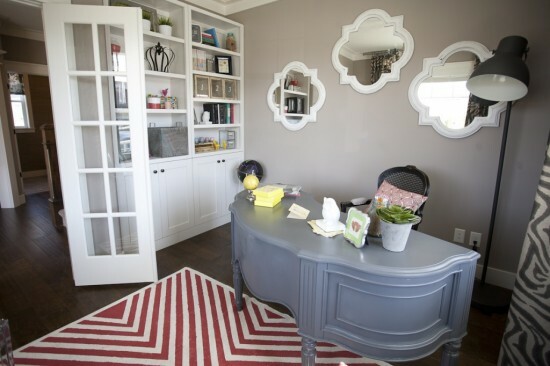 Love that red striped rug! I saw this house on The House of Smiths the other day…I love that you featured it. It is so cute. Wanted to let you know I am re-doing my floors this weekend…we are installing them on the entire first floor. I thought of you since you just got your new floors. Stop by and see my in-progress post! I can’t wait to get it done, actually, my hubby can’t wait since he is doing most of the physical work. :) I am enjoying watching your progress on your rooms! They did an awesome job! 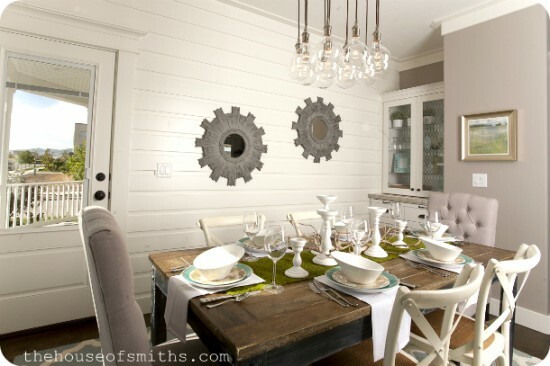 I love the dining room and that planked wall! I love all this and the progress with your house. Can you share some details about your stair wall items? For example, the clock and map, etc.? I would love to do this in our home. Thanks so much for featuring this Melissa! Fun to see my name here on your amazing site. An honor for me really! This is what my dream house would look like! I’m ready for my tour.